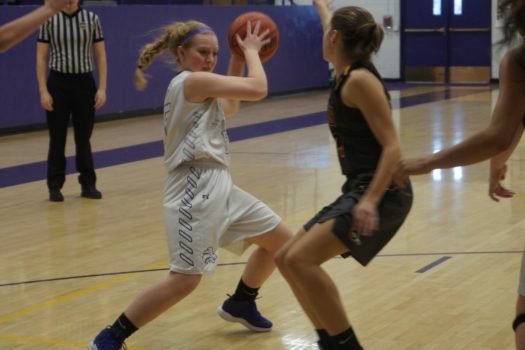 On Saturday afternoon, the LHS varsity girls’ basketball suffered a loss of 34-48 against Green Mountain. Although Green Mountain stayed ahead in all four quarters, the girls were able to shoot and pass well despite the low energy. “In the first half, I think we shot really well which is always really surprising for us, and we worked together as a team,” said junior Eleanor Fuchs. During this game, Puchino and Fuchs, along with senior J’la Ervin helped to close in on Green Mountain but unfortunately couldn’t catch up to them. Even though they lost Saturday, the girls are optimistic and positive about the rest of the season. “I think the rest of the season is going to go well, we’ve improved a lot so far and I think we’ll just keep improving, it’s looking positive,” said junior Susie Puchino. The team plays next on Wednesday, January 23 at Standley Lake High School.